It’s no secret that in today’s digital world an online presence is essential to successfully growing your business. Having a well-designed responsive website is important, but many businesses don’t realize the disservice they are doing their marketing efforts by not using landing pages. Landing pages have much more impact when it comes to the sales process than your website because they are built specifically for conversions. As a marketer, being able to grab someone’s attention is the first challenge. In digital advertising, understanding the value of a viewer’s first click on your ad is crucial. Think about the time you put into coming up with the perfect campaign and the money you are spending to execute it. You want to make the most of that time and money, right? Where you send traffic from your ad is just as important, if not more so than getting clicks to begin with. Clicks themselves are useless if they don’t lead to conversions. You can easily lose a valuable prospect just as quickly as they arrive. Using a landing page is the best way to make the most of your ad spend and to take advantage of that initial interest you generated with your carefully crafted ad. Many times, it is helpful to keep in mind that we are all consumers, including yourself. Companies are actively trying to reach you every single day to sell you their products or services. Think about the magnitude of different advertisements you see daily; whether it’s on TV, radio, billboards, and online. Now think about the number of times an ad has caught your attention AND you acted on what was being offered. If you are like most, it is likely not very often. This helps to reinforce the value of getting a click on your ad at all. Imagine yourself as a consumer in the following scenario. It’s the beginning of Fall and you see an ad for a FREE pumpkin spice latte at a coffee shop close by. The ad has a beautiful image of a white mug, filled with golden goodness, topped with a thick layer of velvety whipped cream and lightly dusted with cinnamon. The ad instructs you to click for a coupon to redeem for your tasty treat. You land on the homepage of a coffee shop, but the delicious pumpkin spice latte is nowhere to be seen and there is no mention of a coupon anywhere. Now, if the coffee shop is extremely lucky, and you are a very determined customer, intent on getting your free latte, you may take a few moments to search for the coupon that was promised to you in the ad. If you are like most people, however, you will close out of the page, confused, irritated and let down. In this example, not only did the coffee shop lose out on a conversion, but they are leaving potential customers with a bad impression of their brand. Wasting someone’s time by not giving them what they expect, they may start to associate the brand with annoyance or, even worse, deception. Many businesses question why they should use a landing page instead of their homepage or an existing page on their site. In short, landing pages increase conversions. They provide a simple, frictionless experience for potential customers and an environment where you can focus your visitor’s attention exclusively on the action you want them to take. Message Matching. This is where landing pages thrive. Having a standalone page designated to a single campaign allows not only the messaging on both the ads and landing page to be consistent, but also the design elements. There should be no doubt in the visitor’s mind that they are in the right place when they arrive. This is where you fulfill on the promise made in your ad. As soon as you make a visitor search for that information, your chance of conversion drops significantly. Generating Leads. Because of their simplicity, landing pages are lead generating machines. Being hyper-focused and goal oriented, you will get more qualified leads, enabling you to engage and market to them along the buying process. The goal of a lead generating landing page isn’t to make a sale, but rather to open the door to more conversation. Eliminating Distraction. It is always best to focus on what you want your audience to do once they land on your page. Everything on the page should have a purpose and support your single objective. Landing pages allow you to eliminate unnecessary distractions, such as navigation bars and any extra external links that will dilute your message and reduce your conversion rate. The biggest thing to keep in mind is to think like the consumer that you are. Have a specific goal in mind for your campaign, provide just enough information to convince someone to take the next step and make the process as simple as possible. The easier you make it for your audience to do what you want them to do, the more likely they are to do it. 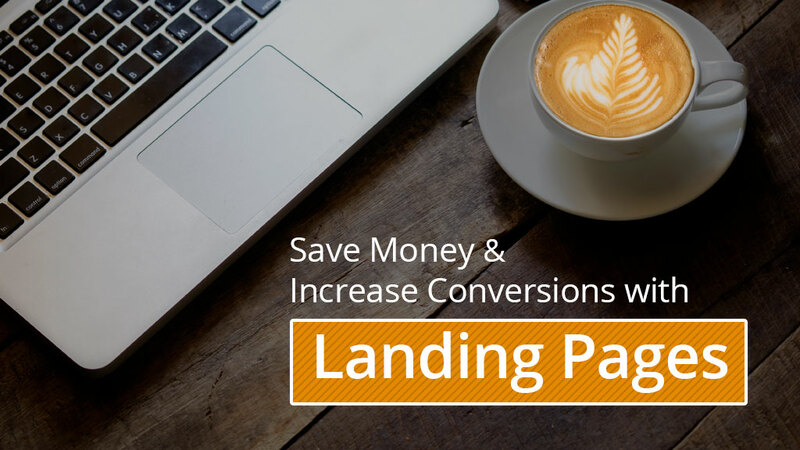 Using landing pages correctly will result in more conversions for the same ad spend, ultimately saving you money.